Obituary – Williams, Rose Marie (Naifeh) « Perry High School Alumni Association, Inc.
﻿- ‘B’ Team Cheerleader ’64-’66, Homeroom Pres. ’64-’65, Jr. Play ’64-’65, Red Hots ’64-’66, Christmas Vespers ’64-’65, F.T.A. ’64-’66, All School Revue ’64-’65, Glee Club ’64-’65, Newspaper Staff ’65-’66, Sr. Play ’65-’66. Rose Marie Williams, 47, teacher, died Monday, April 15, 1996. 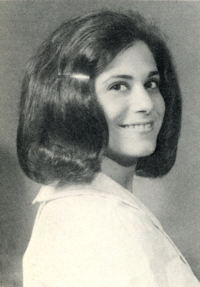 The daughter of George and Victoria Naifeh, Rose was born August 22, 1948 in Tulsa, OK. After her graduation from Perry High School in 1966 she attended Central State College in Edmond, Oklahoma. Services 11 a.m. Wednesday, Rose Hill Cemetery Chapel in Tulsa, OK with burial in the “Naifeh” plots.